Life Before the Dinosaurs: Marrella. Marrella is a genus of arthropod from the Cambrian Period. It is the most common fossil in the Burgess Shale. Since Marrella had a diffraction grating pattern, it was probably very colorful. Marrella grew up up to 2 centimeters long. Marrella had four spines running down its back. 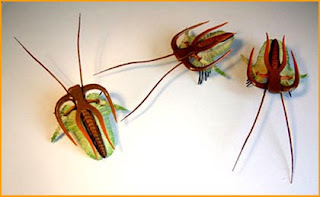 It had two pairs of antennae, two long ones and two short ones. Marrella had 24 to 26 segments. At the end of the thorax Marrella had a tiny telson. Marrella's legs had two parts, the gills on top, and on the bottom it had walking legs. Marrella was a marrellamorph related to the Devonian Mimetaster. 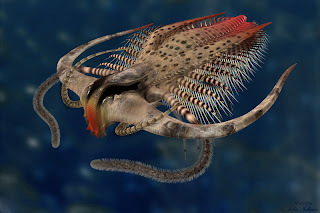 Monster predators like Anomalocaris, Amplectobelua, and Hurdia probably didn't bother to eat it, because it was much too small. One specimen of Marrella shows it molting. 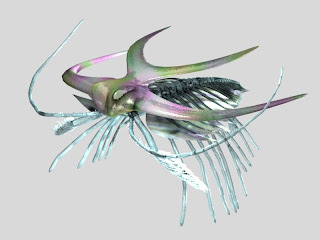 Scientists have discovered over 25,000 specimens of Marrella in the Burgess Shale. It was the first fossil that Walcott found there. I discovered an arthropod yesterday. I thought I had found a frozen Subway sandwich in my freezer, which I then placed in my fridge to de-frost. This morning I found four de-frosted arthropod tails instead, which I steamed for 20 minutes and, dipped with butter, I consumed. I would also like to eat that!